Human ABCC5 / MRP5. This antibody is expected to recognize both reported isoforms (NP_005679.2; NP_001018881.1). Synthetic peptide KDIDIGKEYIIP-C from the N-terminus of human ABCC5 / MRP5 (NP_005679.2; NP_001018881.1). ABCC5 / MRP5 antibody was raised against synthetic peptide KDIDIGKEYIIP-C from the N-terminus of human ABCC5 / MRP5 (NP_005679.2; NP_001018881.1). Percent identity by BLAST analysis: Human, Gorilla, Gibbon, Monkey, Marmoset, Dog, Bovine, Elephant, Panda, Horse, Rabbit, Pig, Turkey, Chicken (100%); Mouse, Rat (92%); Hamster (83%). Store at -20 degree C. Minimize freezing and thawing. Small volumes of anti-ABCC5 antibody vial(s) may occasionally become entrapped in the seal of the product vial during shipment and storage. If necessary, briefly centrifuge the vial on a tabletop centrifuge to dislodge any liquid in the container`s cap. Certain products may require to ship with dry ice and additional dry ice fee may apply. 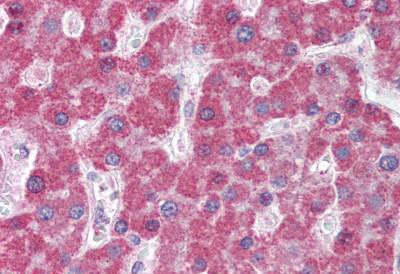 Anti-ABCC5 / MRP5 antibody IHC of human liver. Immunohistochemistry of formalin-fixed, paraffin-embedded tissue after heat-induced antigen retrieval. Antibody concentration 5 ug/ml. Antibody (0.5 ug/ml) staining of Human Frontal Cortex lysate (35 ug protein in RIPA buffer). Primary incubation was 1 hour. Detected by chemiluminescence. NCBI/Uniprot data below describe general gene information for ABCC5. It may not necessarily be applicable to this product. ABCC5: Acts as a multispecific organic anion pump which can transport nucleotide analogs. Belongs to the ABC transporter superfamily. ABCC family. Conjugate transporter (TC 3.A.1.208) subfamily. 4 isoforms of the human protein are produced by alternative splicing. 1. This locus was associated with an increase in risk of PACG in a separate case-control study of 4,276 primary angle closure glaucoma cases and 18,801 controls (per-allele OR = 1.13 [95% CI: 1.06-1.22], P = 0.00046).